i am an avid list maker... i make lists for everything. what i need to get at the store. what i need to pack before a trip. my daily chores. my weekly chores. my bill due dates. to do lists. what to do this week. what to do before the baby comes. what i want to to do in the next year. lists of clothing i wish i could buy, makeup products i want to try. lists of my favorite books, books i want to read, books i have read this year. this list could go on and on. lists make me feel like my life is in order. although it is not, although i have half written lists, half crossed out lists, half dreamed lists in my head, the lists really do little to help me in life. it is a huge list. a list of 14,000 to be exact. i carried it around with me, and smiled at the lines on the inside of the book. matthew bought me a frappacino, and we walked up and down the aisles of the barnes and noble touching the books, and breathing in the new page smell. we oogled sports books, and games, and novels, and classics, we looked at the bibles, and all the center aisle displays. we giggled, and talked, and avoided touching hands as we grabbed for books among the stacks. when i grabbed that book, i didn't want to let it go, i walked it around with me as we continued to look around the store. as we were leaving the store, matthew grabbed it out of my hands, and carried it with him up to the checkout aisle. he bought me that book. and i think i loved him then... and i was so happy to have that giant list book. Barbara Ann Kipfer compiled this list from 20 years of lists and journals. 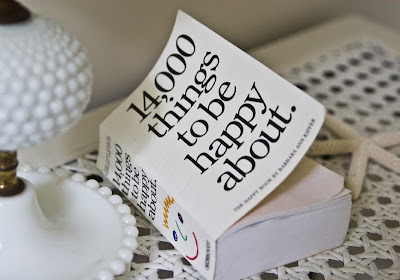 the pages contain snippets of what make her happy, and lots of things that make everyone happy. trivial things, silly things, and deep heartfelt things. i love this book, and i often pick it up to glance at the joy inducing list between its cover. i just love this list. i love this book. i love thinking about the day i got it, and how i loved matthew even then... he didn't know it yet. but i think he may have loved me too. i love the simplicity of a list, and the simple things that can make you happy. i love that in reading this list... you can see and understand that beauty, and joy, and love, can lie in everything. I want that book!! :D I loooove my lists too! We had that book in my house too! And Barnes and Nobles...I could spend a fortune there.. Lists make me happy too. I'm like you, lists EVERYWHERE on paper, on my phone, on my computer, on my blog, in my head.